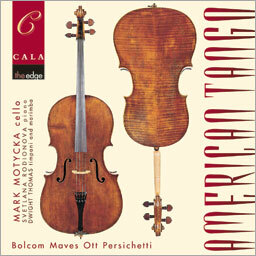 Cala Records presents a unique recording of world première compositions featuring fascinating and accessible works by leading American composers for cello and piano, cello and timpani and cello and marimba. Also included are enlightening recorded comments by Bolcom, Ott and Maves on their works, indexed at the end of the CD for interested listeners. All works are drawn from the last 40 years and include unusual and enticing combinations of cello and timpani, and cello and marimba. The result is a highly original recording of contemporary cello music - every single track is a world premiere recording! With this recording, Cala is pleased to present Mark Motycka who performs widely as a chamber musician as well as with the Omaha Symphony and as Principal Cellist with the Lincoln Symphony Orchestra, both in Nebraska.